Tilda Swinton and Tom Hiddleston make the perfect pair of ivory-skinned wraiths in maverick moviemaker Jim Jarmusch’s Only Lovers Left Alive. These fabulously aloof, effortlessly stylish creatures are the coolest people you could imagine. They were hipsters before it was cool to be a hipster—a few centuries before, actually. In the film’s hypnotic opening sequence a spinning 45-rpm record fills the screen, and Wanda Jackson’s witchy, bewitching wail fills your soul. The image dissolves into a revolving bird’s eye view of two silent, still figures, she surrounded by countless stacks of books strewn across the floor, he reclined in a couch amid vintage guitars and vinyl records, miles apart yet seemingly in the same room. Round and round they go, the camera circling closer and closer, inviting you to follow down the rabbit hole of this dark, delirious, delicious film. These bloodsuckers might be after your hemoglobin, but their story and style will start seeping into your veins as early as that first shot. Jarmusch’s undead really know how to live. Isolated by the blessing and curse of eternal life, Adam (Hidleston) resides in a dilapidated mansion on the outskirts of Detroit. The woeful and weary loner finds his only solace in penning mournfully mesmerizing mood music. (The film’s score, by SQÜRL and Jozef van Wissem, is a wonder onto itself, and well worth the price of admission alone.) Ian (Anton Yelchin), an eager but none-too-swift young admirer who might or might not have kept the secret of Adam’s underground recording tends to his every artistic need, namely acquiring rare guitars. When the musician lets slip that he saw Eddie Cochran—who died in 1960—play a flawless Gretsch that Ian admires, he quickly remembers to add “on YouTube,” and the young man seems unperturbed by Adam’s nocturnal habits or the fact that his bathroom is perennially out of order. Adam’s spouse and soulmate is Eve (Swinton), a runway-ready vision in white, swathed in creamy silk scarves and a mass of beige hair, with fawn-hued leather gloves and skin like the inside of a seashell. Living in Tangiers, she spends her time speed-reading books in every known language and lingering in all-night cafes with Christopher Marlowe (John Hurt), who still holds a grudge, five centuries after the fact, because Shakespeare stole his plays—yes, that Kit Marlowe. According to Jarmusch, he’s alive and well, acting as Eve’s mentor, confidant, and blood supplier. Adam and Eve, you see, are not the type to go out and bite necks. They purchase their O-negative nutrition from medical professionals (including one played by Jeffrey Wright) and drink it from long-stemmed, stylish aperitif glasses, because hunting is so 15th century. The two vampires have been in love for hundreds of years, and they are so devoted to each other that they can spend long stretches of time apart on separate continents, like nuclear particles in Einstein’s theory of entanglement (which is explained in the dialogue), but still keep the connection between them alive. Eve senses from halfway across the globe that Adam is a bit down—or down-er than usual—and books a couple of night flights to visit. When she arrives, the two embrace like secret Victorian lovers; he peels off her glove and kisses her palm. There is instant rapture, a perpetuation of the presumed longest love affair in the world (a photo documents their third wedding, in 1868). Trying to sum up the film, it strikes me it’s less a story than a sensibility. 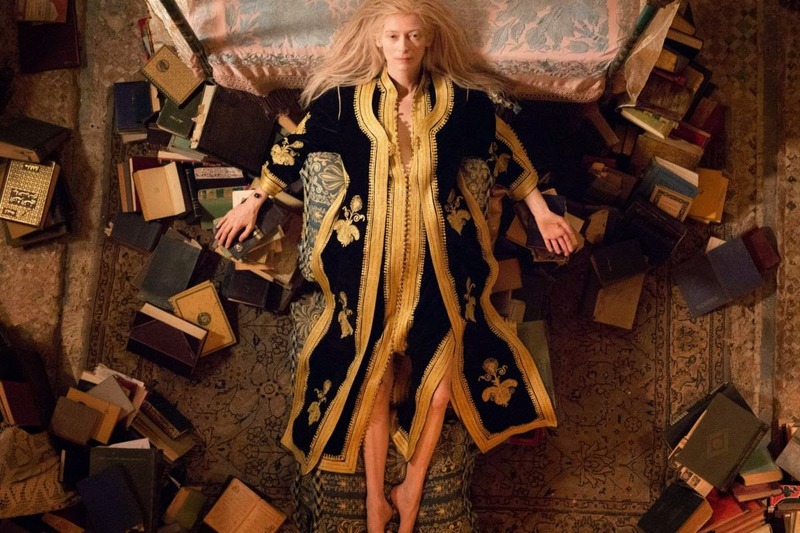 Made up of comical musings, nostalgic longing, and sorrowful loss, Only Lovers Left Alive has little plot to speak of. It’s all atmosphere and attitude, as evanescent as a dream. In its painterly composition and rich detail, it’s a film to luxuriate in rather than watch, a slow-burn celebration of art, style, and aimless conversations. The emphasis not on action but interaction. The pleasurably languorous pace picks up when Eve’s brazen, bratty little sister Ava (Mia Wasikowska) shows up for a visit—to Adam’s comical dismay—and soon upends their carefully maintained universe. This section is essentially a light comedy of social mores, but it’s also the weakest of the movie. Jarmusch’s denizens of the dark are way too cool for a regular movie plot, just as they’re too cool for the chaos that exists outside their carefully curated domains. Their hermetic lairs are awash with rare books, objets d’art, collectible musical instruments, exotic fabrics and general exquisite taste. The vampires are a kind of aesthetic aristocracy among us mere mortals. The ordinary humans of the digital age, derisively called zombies, have lost or squandered the ability to appreciate art and all the tactile, sensual glories of the past or fathom the possibilities of the future—Adam is especially sick of mankind’s “fear of their own imaginations.” We’re too plugged in and caught up in the new to have any time for the old. But, like the circle that opens the film, everything always comes round, and the old is just on the cusp of being new to someone. Having seen the world hit so many lows (plagues, droughts, fires, inquisitions), Eve is serene in her knowledge of history’s circular nature and hopeful for renewal. When the lovers embark on languid explorations of the darkened ruins of Detroit, most poignantly the Michigan theater, the film becomes a rueful, often ravishing study of a civilization teetering on the very brink of extinction, but one that is surprisingly hopeful. As he did with Memphis in Mystery Train, Jarmusch turns Only Lovers Left Alive into an elegy to a great city which has fallen but will, Eve is certain, rise again. “There’s water here. When the South is burning, this place will bloom,” she softly predicts. Like Edward Hopper, the film’s writer-director captures the particular look of this tawdry American landscape and finds beauty and lyricism in the most unlikely places. Motor City’s crumbling factories and decrepit theaters are a sad sight, indeed, but not a forlorn one. As shot by cinematographer Yorick Le Saux in nighttime traveling shots, the desolate Detroit cityscapes, as well as Tangiers’ acrid backstreets, turn to visual poetry. And if Jarmusch and, of course, Adam and Eve can find the beauty in the rundown, ramshackle side of town, why can’t we? The title of the movie has a double meaning. The main characters are indeed lovers. They love each other deeply, but they also love art, beauty, animals, people, places; they love love. And it is because of this that they survive. What is there to live for, Adam asks Eve while contemplating ending his own life. “Appreciating nature,” she says pensively, “kindness, and dancing.” The words flow from the heart and soul of Jarmusch himself. His movie becomes a fierce, funny, stylish plea to the human race from the undead to enjoy life and embrace the wonders of the world around us. If this all sounds a bit didactic, it’s not in practice. Only Lovers Left Alive is as silly as it is deeply serious. As usual, the filmmaker mixes high and low culture, intellectual elitism and wry, off-kilter humor, letting show an intensely personal, abiding belief in the power of art, science, philosophical inquiry, and intellectual daring. In the hands of a lesser filmmaker it would all be terribly condescending and snobbish, but… well, maybe it still is a little bit, but that’s part of the fun, and it’s a hell of a lot better than the alternatives. In the toothless era of Twilight and its myriad defanged imitators, this is the vampire romance I’ve been waiting for. Leave it to the godfather of contemporary American independent cinema to breathe life into an overworked, underwhelming genre and prove there are new sights and sounds and meanings to be derived from the conceit of characters who rarely sleep, don’t die, and feast on human blood. Utterly, glowingly alive, these “undead” don’t need the sun to sparkle. They’re shining, soulful superstars, lit up from within. Only Lovers Left Alive’s got bite. Read my analysis of Jarmusch's Night on Earth and Coffee and Cigarettes HERE.